One hundred drawings selected from across the artist’s career are shown alongside two of his most important bronzes. Although best known as a sculptor, Moore was an incredibly talented draughtsman. He used drawing as a means by which to hone his observation skills, as well as develop ideas for his sculptural creations. This exhibition accounts for Moore’s two-dimensional practice, starting with the figure drawings he made as a student in Leeds. These early works are joined by the Shelter Drawings he produced in the early 1940s, sheep drawings from the 1980s and a selection of his rarely-exhibited final works, such as the shut-eye drawings. Together they demonstrate his commitment to this lesser-known area of his artistic work. 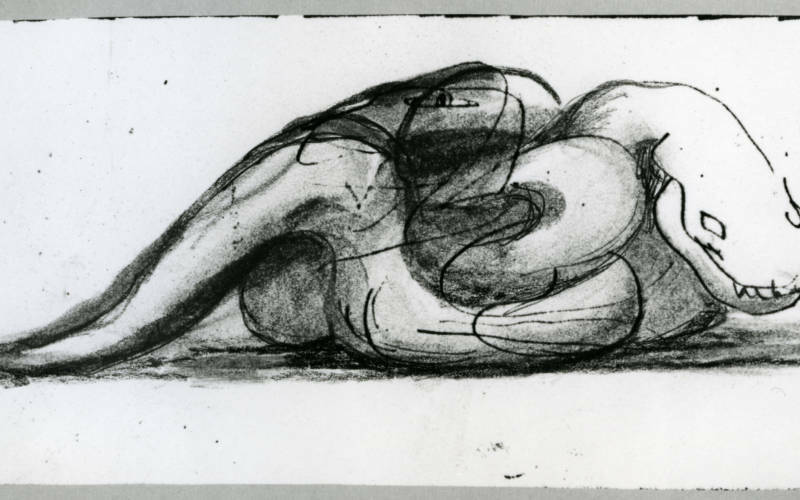 In order to make the connection between his drawing work and sculptural practice explicit, the display includes two of Moore’s iconic bronzes. King and Queen is a piece from one of his most celebrated figural groups, while Hill Arches (HMF), has been chosen for its baroque architectural qualities and is on display in the garden.